Home » » Gov. Obiano Reacts To Ekwueme’s Death, says "It's Painful"
Gov. 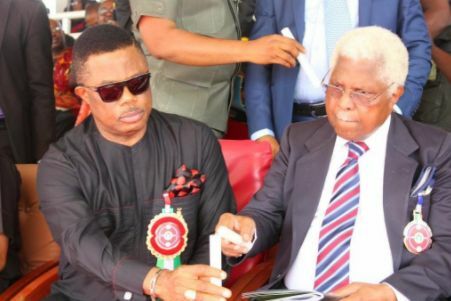 Obiano Reacts To Ekwueme’s Death, says "It's Painful"
Anambra State governor, Chief Willie Obiano, has confirmed the death of a former Vice President, Dr Alex Ekwueme, describing it as painful. Speaking on the phone with Punch in Awka, through his media aide, James Eze, the Governor said the state would miss the wise counsel of the sage. Dr. Ekwueme died on Sunday in a London hospital. A statement issued by his brother and the traditional ruler of Oko, Igwe Laz Ekwueme, said that he died in a London clinic on Sunday, November 19. The statement read, “Ekwueme family regrets to announce the peaceful passing away of their patriarch, the former Vice-President of the Federal Republic of Nigeria Dr. Alex Ifeanyichukwu Ekwueme, GCON.